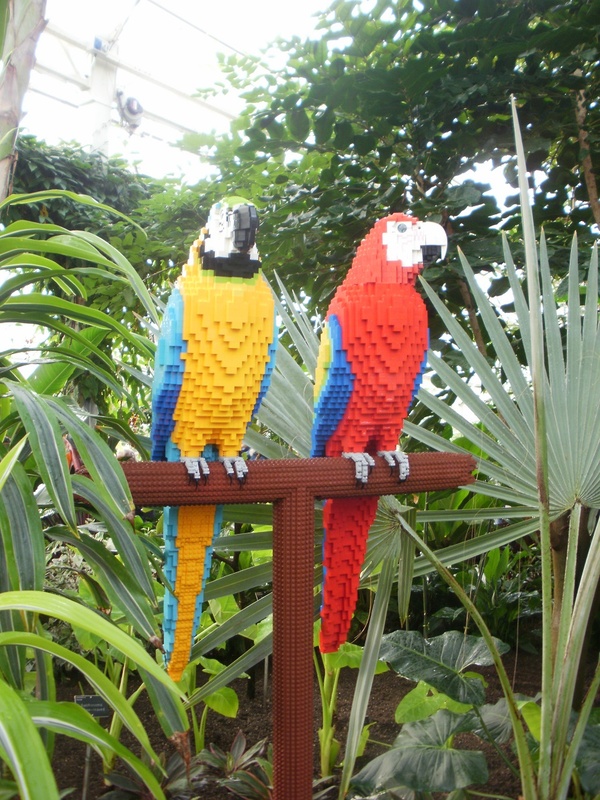 We’d been to see the Lego animals at Wisley, and very good they were too. 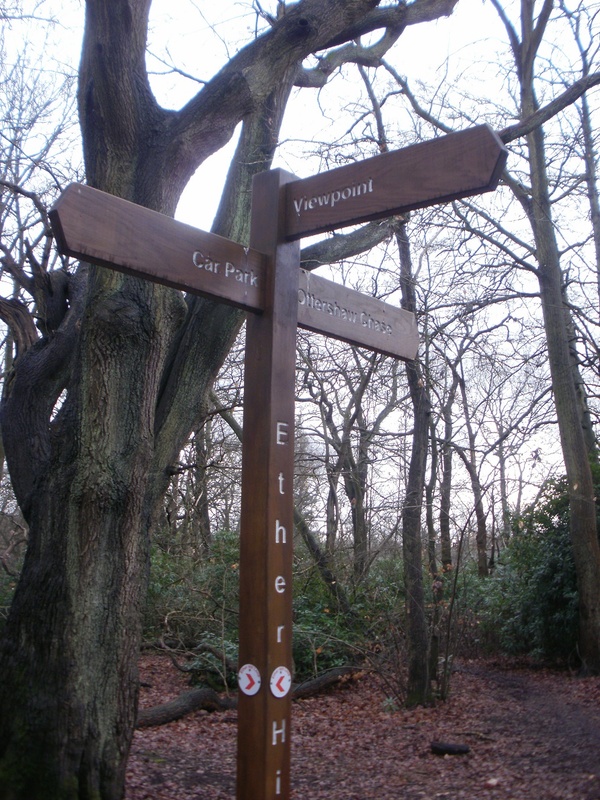 Afterwards, on our way home, we stopped at Ottershaw to finish off the cache series that we had started in mid-January, planning to find the caches in the northern half of the series, around Ether Hill and Queenswood. Our first cache was close to the car park; we found it very quickly, though it won’t be that simple come the spring, when the vegetation starts to grow, and afterwards sat unobtrusively on a nearby seat to sign the log and watch the many, many dogs enjoying the open space, some fast some slow, all waggy (and that’s just the dogs! ), who were accompanied, of course, by their owners. There were just as many dogs in the woods. We had to resort to the ‘make a fictitious phone call’ trick so that we didn’t look suspicious while a dog-walking muggle and friends moved out of sight. My, these woods are dog heaven! 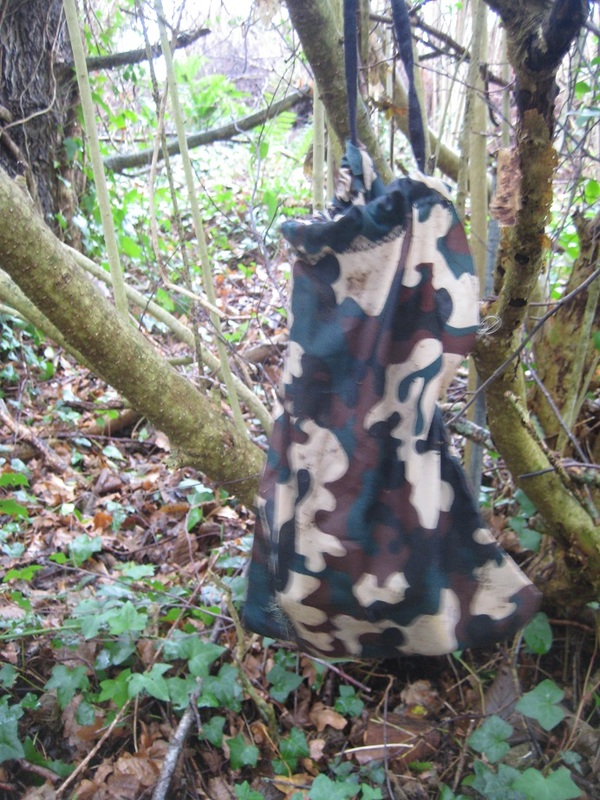 It was worth waiting, as we then found a trackable lurking in a large cache. 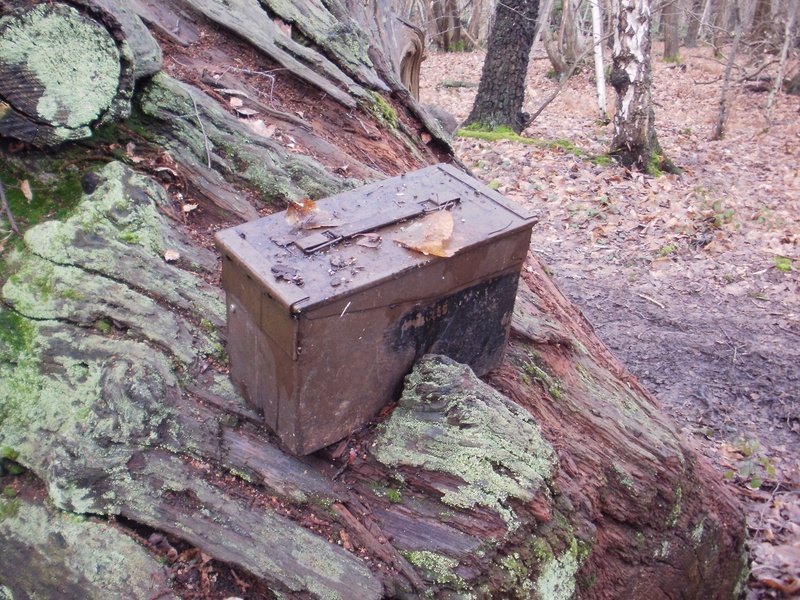 We carried on through the trees, choosing a random route, and finding an ammo can (even bigger! 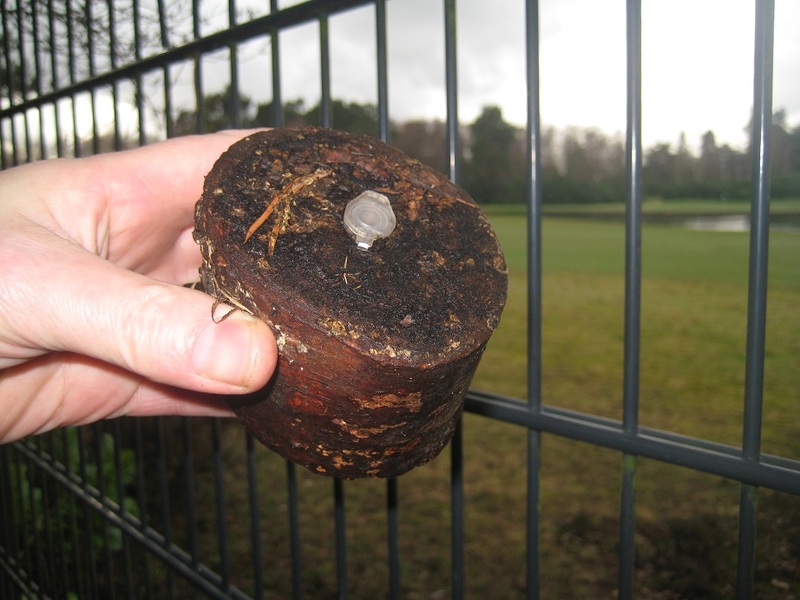 ), then a small cache at the edge of a golf course. Everywhere, everywhere, were dogs and dog walkers; just how many dogs live around here? 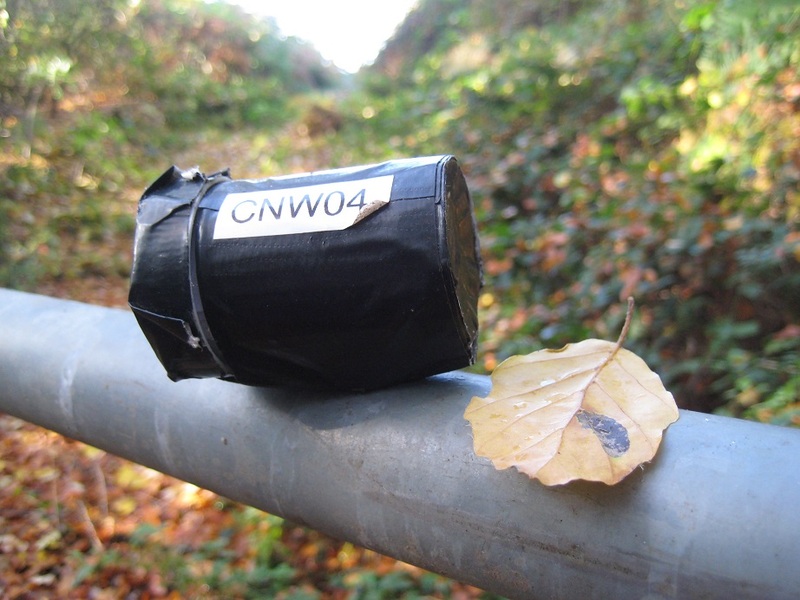 A final cache lay just over the A319 in Ottershaw Chase. For a moment, there were no dogs, and no muggles, and we had a chance to search uninterrupted. It paid off, as we found another cache and another trackable. Our plans for the morning were thwarted by light drizzle, a gusting wind and a high tide. We had intended to spend the morning revisiting a multi-cache placed just above the high water tide. But the wind and rain meant the sandy beach was narrower than we would have liked so filed the cache away for a future visit. Instead we focussed on three town centre caches. We drove away from the hotel, and found – after several circuits of the local roads – a parking place and headed off for our first cache. It was only 200 feet away, and we were very surprised to find when we arrived it was ON church property. We thought we could see the cache from the pavement, so we entered through the gates of St Paul’s Parish Church. 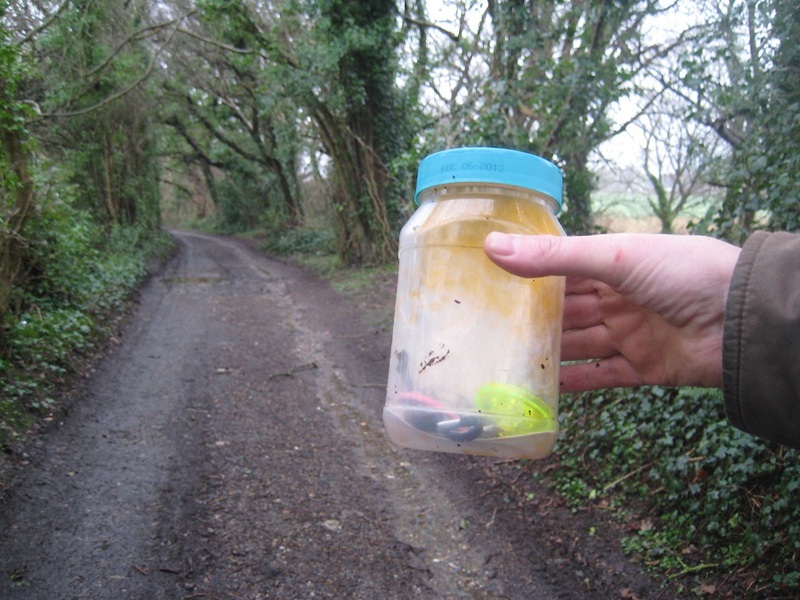 Of course, what we saw from the roadside wasn’t the cache, but we did then spot a nearby piece of camouflage and delightful watertight cache container. We dropped off the Blue Lamb Proxy Geocoin here, as we weren’t sure what other size containers we would find. 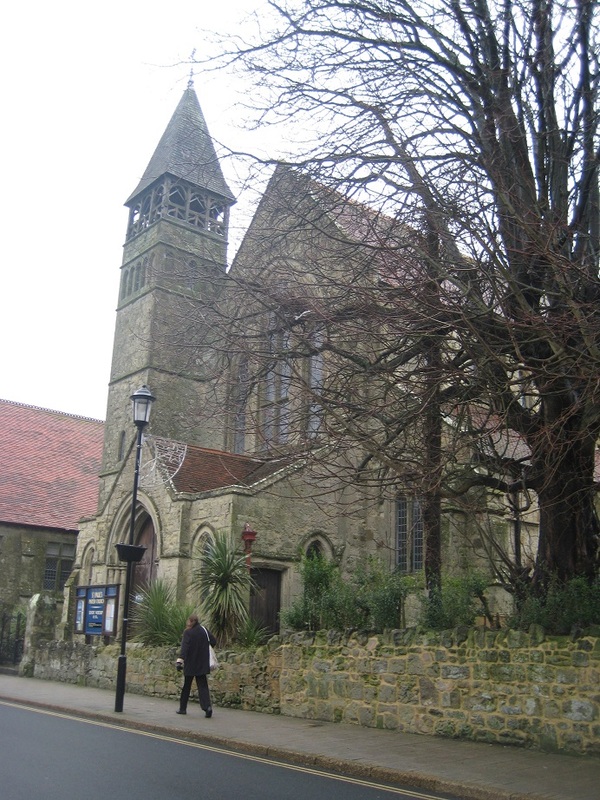 We then walked about 1/4 of a mile passing by many a Shanklin house, and more infuriatingly a small supermarket where we could have parked without angst for an hour or two. 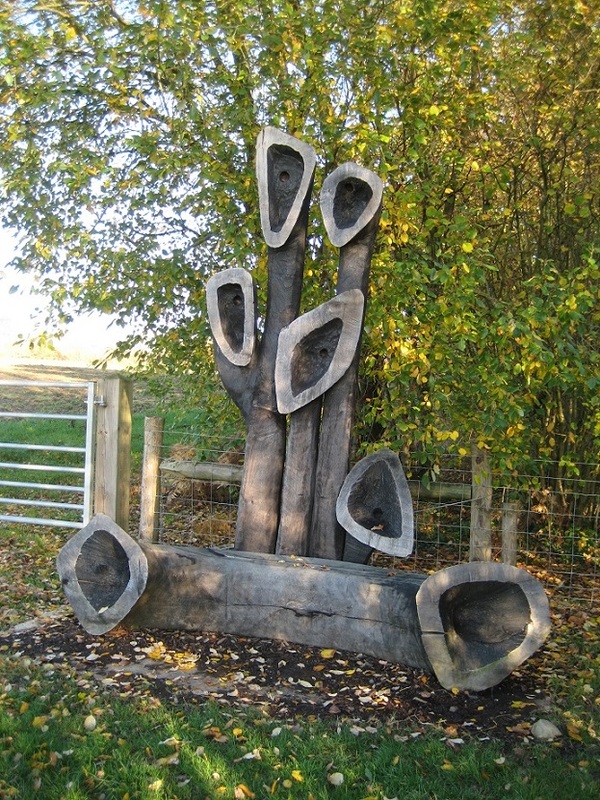 We took a small footpath between houses and arrived at a piece of woodland. 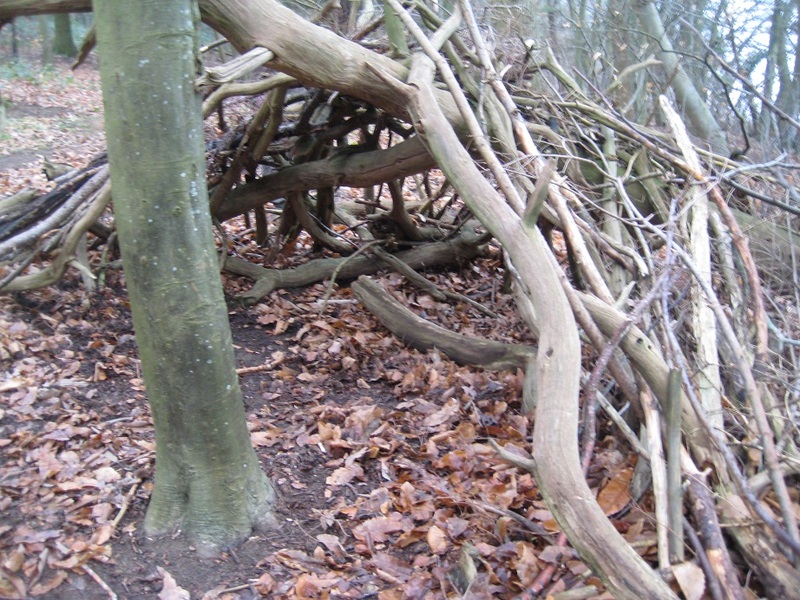 This was the Sibden Hill and Batts Copse Nature Reserve, and hidden just inside was our target. 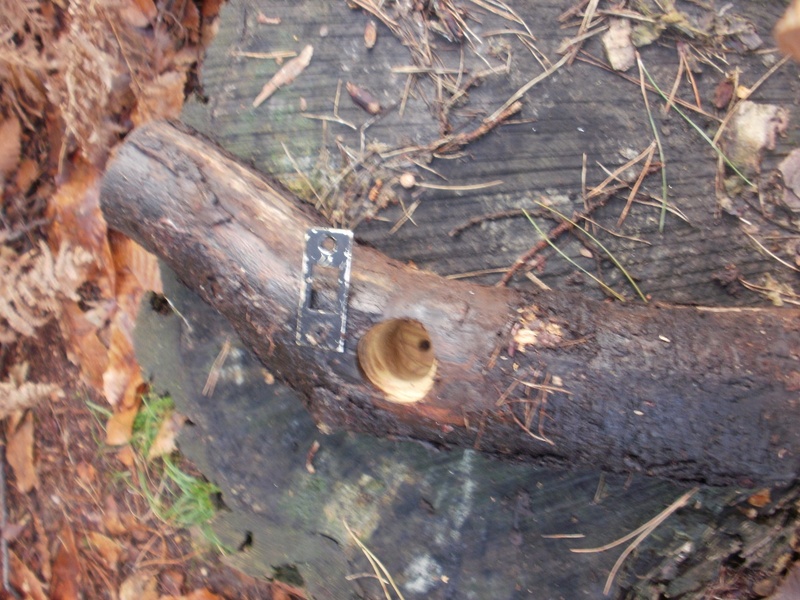 The hint was quite curious “at the base of pipe tree”. 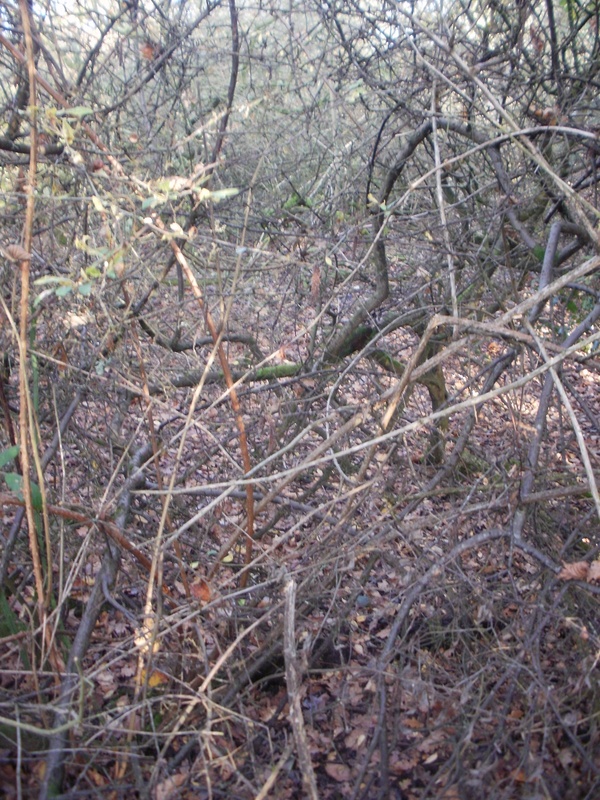 Clearly the cache was near the ground so we searched behind various trees, in roots, in fallen trees all to no avail. Then we saw a tree growing around a metallic pipe. Why the pipe was there, we don’t know, but this was the tree we needed. 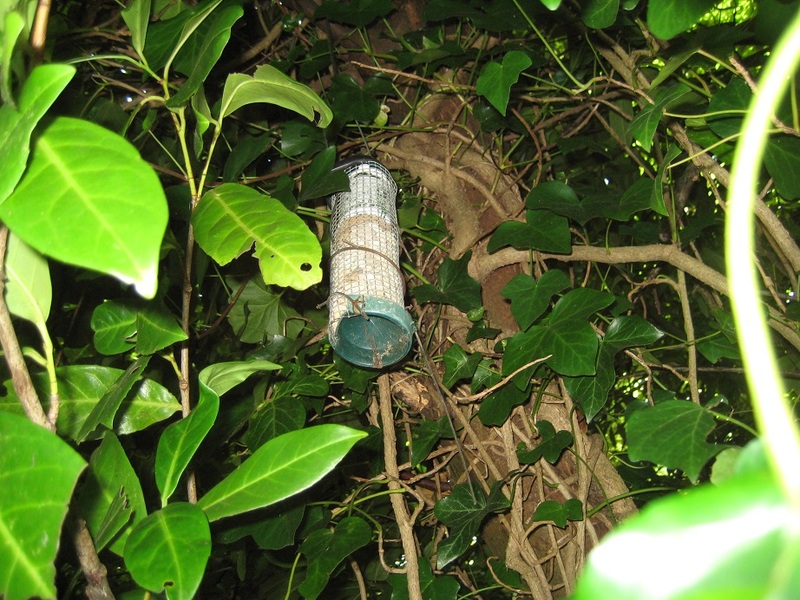 A small brick covered the cache, and once removed we wondered how we had not see the pipe on our initial inspection. How did we miss this ? Another 1/4 mile walk followed, retracing our steps in part but we soon turned off to follow the wonderfully named ‘Red Squirrel Trail’. 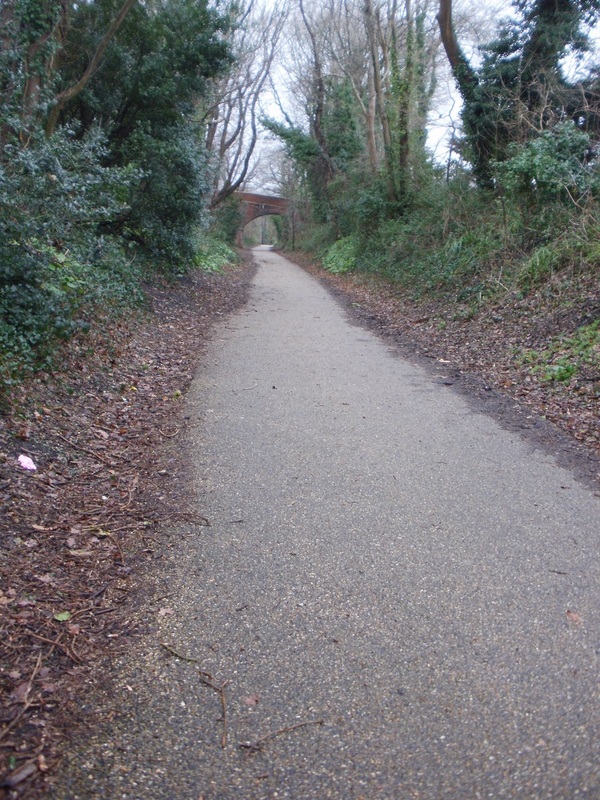 This is a 32 mile cycleway/footpath primarily following the route of an old Isle of Wight railway. The route starts in the extreme North of the Island at Cowes, and loops round both Sandown and Shanklin in the South East. Such a long trail to follow and we walked about 300 yards! The path should have been tranquil, but waterjet-cleaning was going on in the neighbouring caravan park, which made it quite noisy. This time a hollow tree formed the host, but in our haste to bypass a large puddle we walked right by GZ ! Last cache of the day! So three caches found, and with time ticking and a ferry waiting, we headed back to car (via the supermarket to buy some sandwiches) for the journey home. The excesses of Christmas needed to be walked off and the Chantries seemed an ideal circuit. 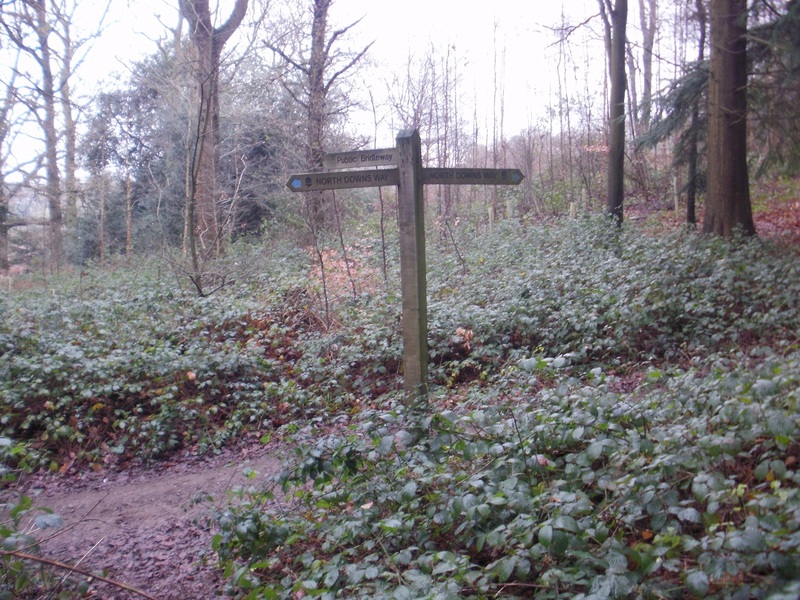 The Chantries (or Chantry Wood) to give it is proper title is situated a few miles South East of Guildford and comprises 78 hectares of mixed woodland. 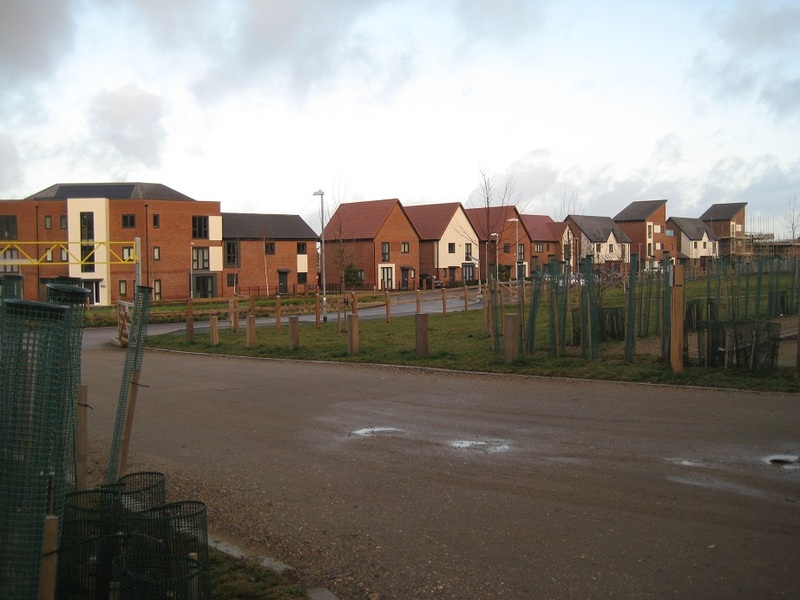 It is also an Area of High Ecological Value within an Area of Outstanding Natural Beauty. 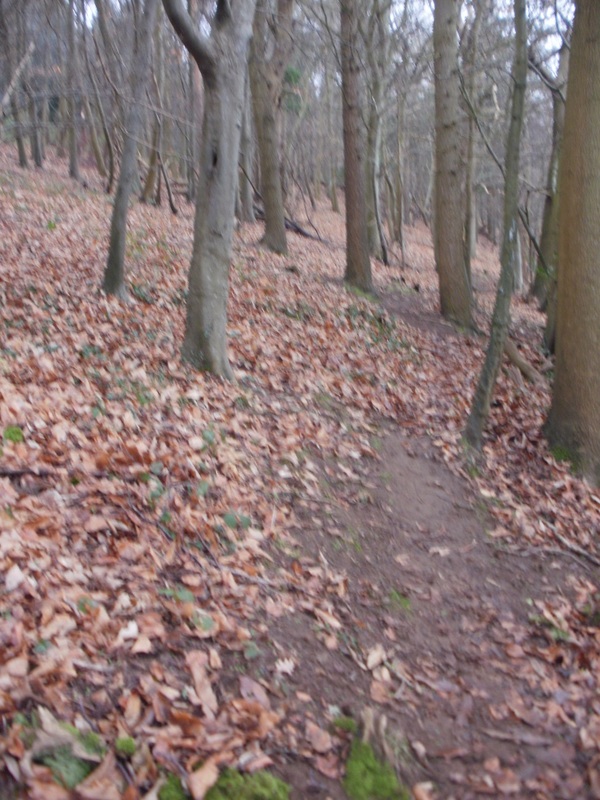 The North Downs Way runs in its Northern boundary. 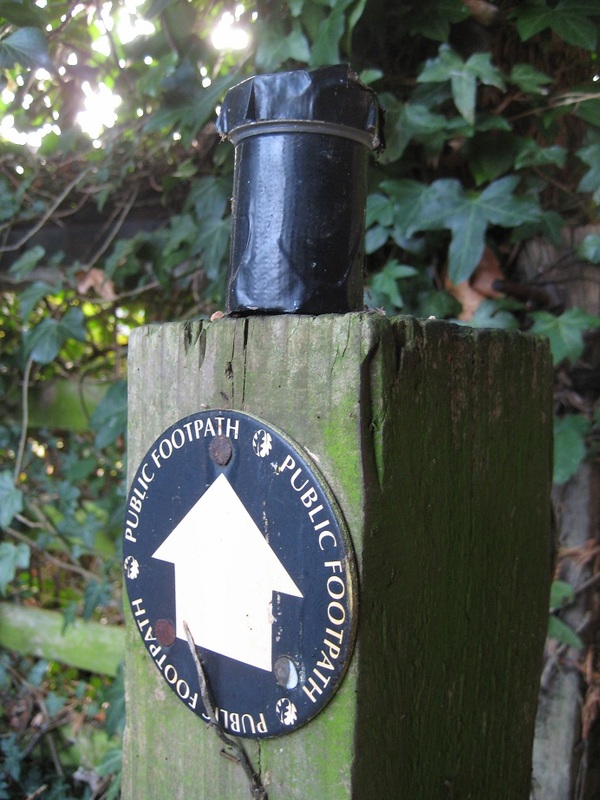 There are lots of paths (mainly running West/East) and plenty of hiding places for geocaches. 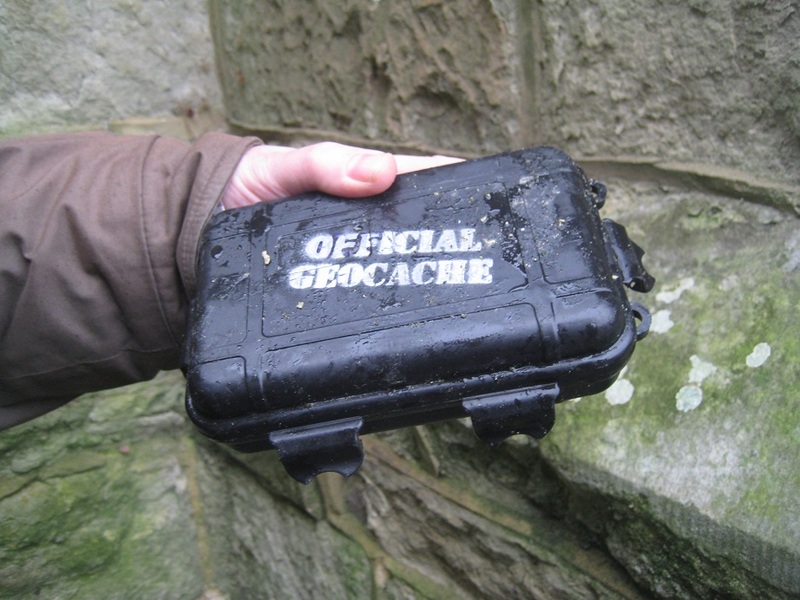 Indeed there are just under 20 geocaches in the area, we chose to attempt 14 of them. We omitted a couple of terrain 4/5 tree climbs, a couple of puzzle caches we couldn’t solve and two quite detailed Earthcaches. 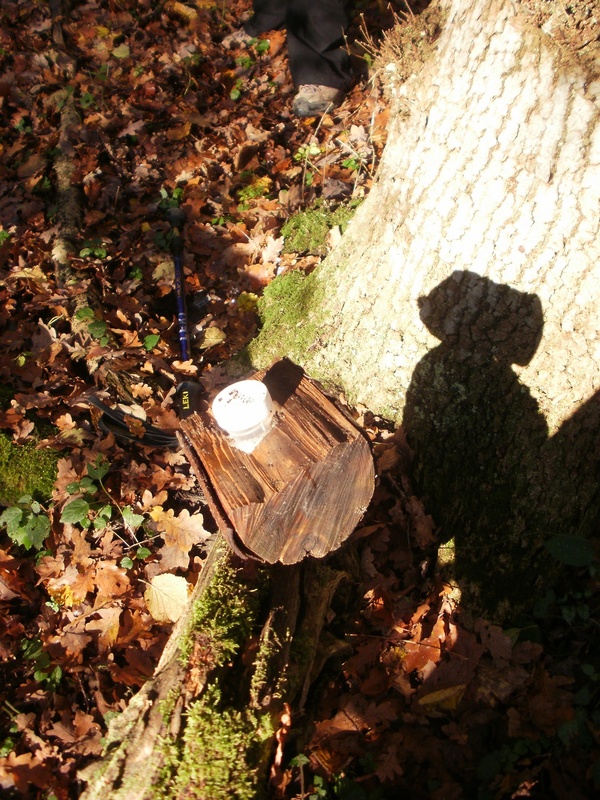 This left us a Compass series set by ===sgb (8 caches had been placed at strategic compass points around the wood) and 6 caches placed by The Perkins Family. The wood is served by a smallish free car park, and at 9am it was already half-full. 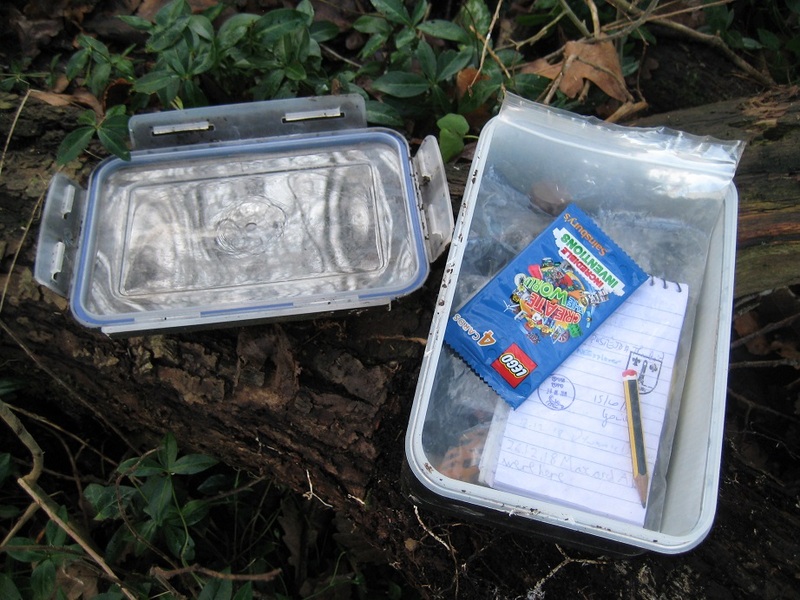 Our first cache (NORTHWEST) was hidden in a small hollow just off the main path. In order to get to the cache we had to walk past it on the path, and then pick up a small track and walk back. This was a recurring feature of our walk : get a good fix on the location, and then find the sometimes indistinct cacher’s path a short distance away. We hadn’t got into this routine at cache 2 (WEST) as the GPS pointed straight up a steep bank. Armed with geopole, Mrs Hg137 hauled herself up the bank, grabbing tree after tree as she climbed. 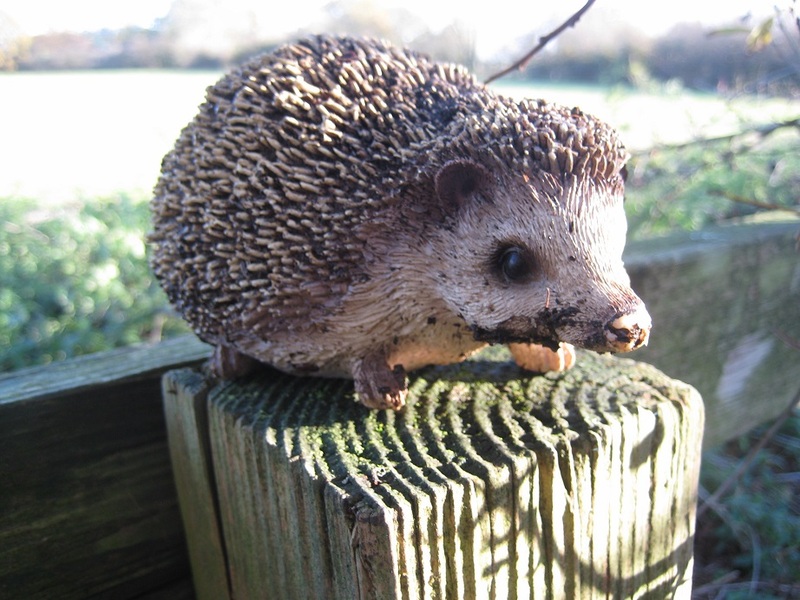 Meanwhile Mr Hg137 scoured the footpath just in case the GPS was wrong. It wasn’t .. and soon the ‘Found it !” cry was heard. This gave Mr Hg137 the opportunity to see if there was an easier route to descend. There was ! A few yards further on, a set of steps yielded easy access to the cache site. Our next cache was our first failure of the day. Located in a wooden Den. We lifted every log we could. We sat in the Den looking up, down, left, right. We walked around the Den but all to no avail. 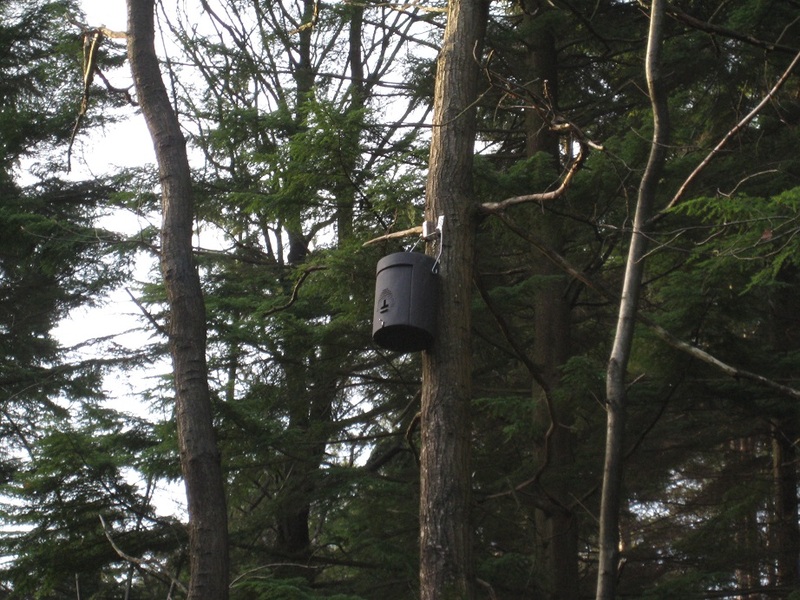 A great place for a cache, but clearly too clever for us. Somewhat frustrated we walked on and were grateful for an easy find (SOUTHWEST). Then a longish walk leaving the wood to find SOUTH (stopping only to admire three roe deer as they ran within yards of us). 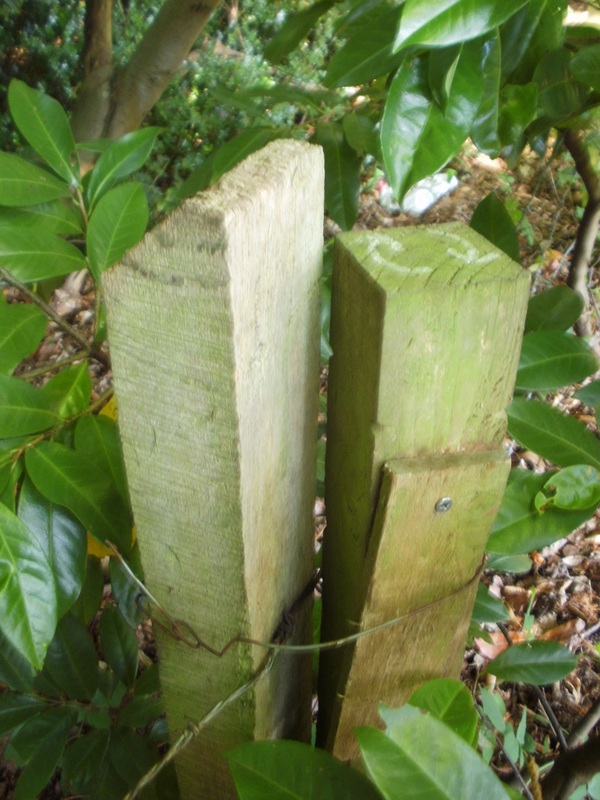 It was hidden close to a stile, now very unused as it was surrounded by brambles and branches. The hint made little sense (‘Raccoon’) and after 10 minutes of being attacked by thorns we left defeated. 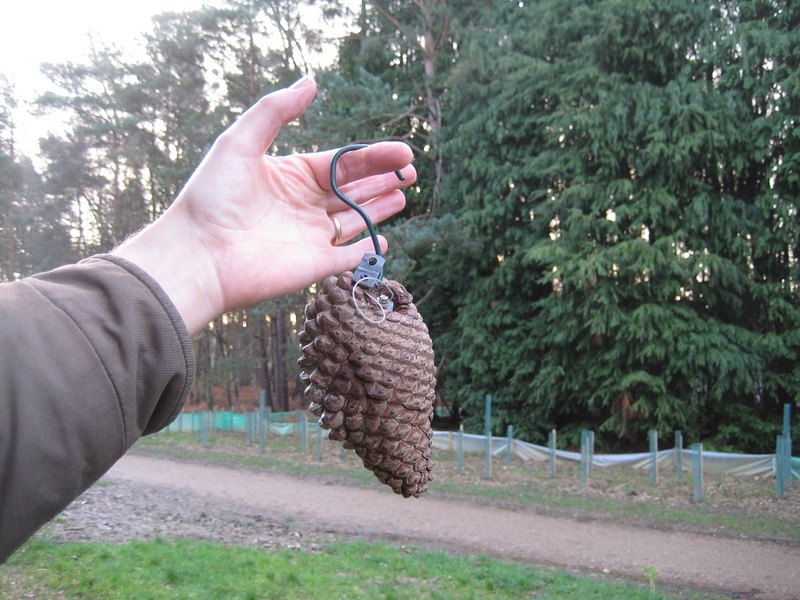 Five caches attempted, and only three finds. Several cuts and grazes accumulated. Time for a coffee, on one of the few seats we saw all day. 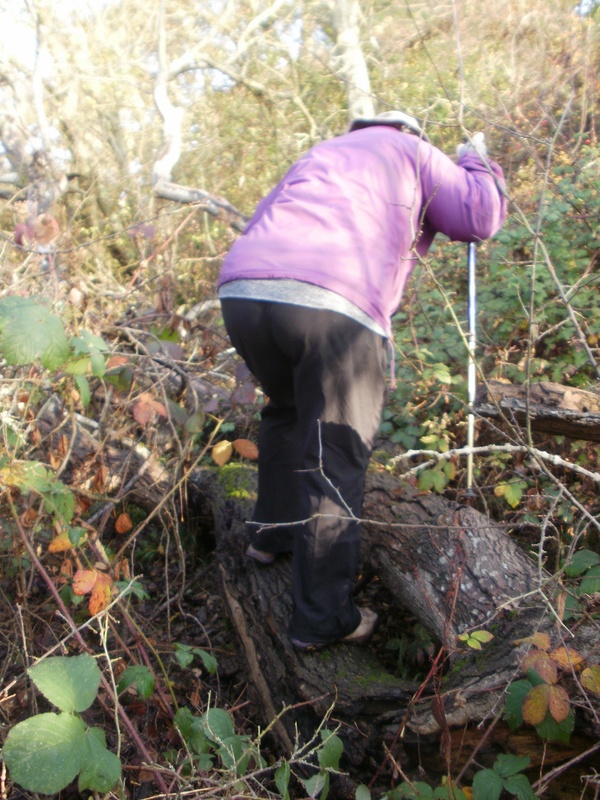 Our next caches, set by the Perkins Family, were on ‘An Impassable Path’. 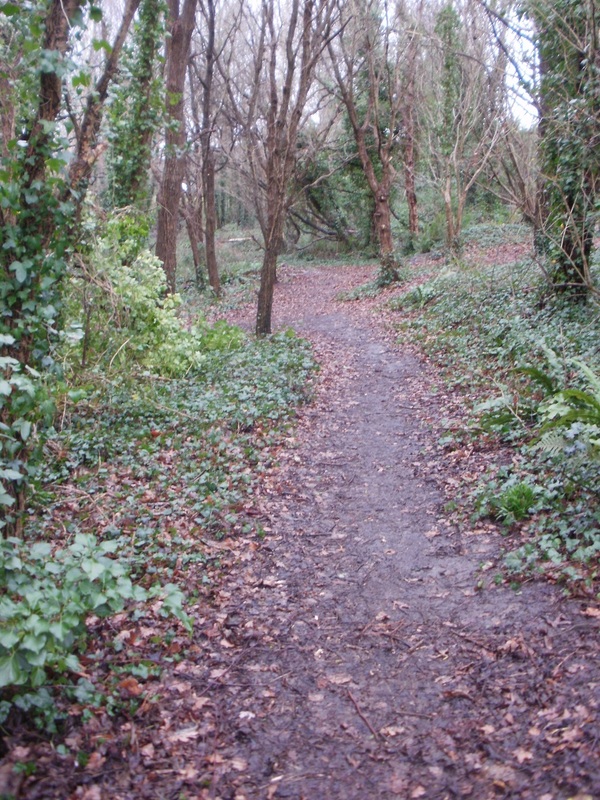 Over time an official path had become very overgrown. 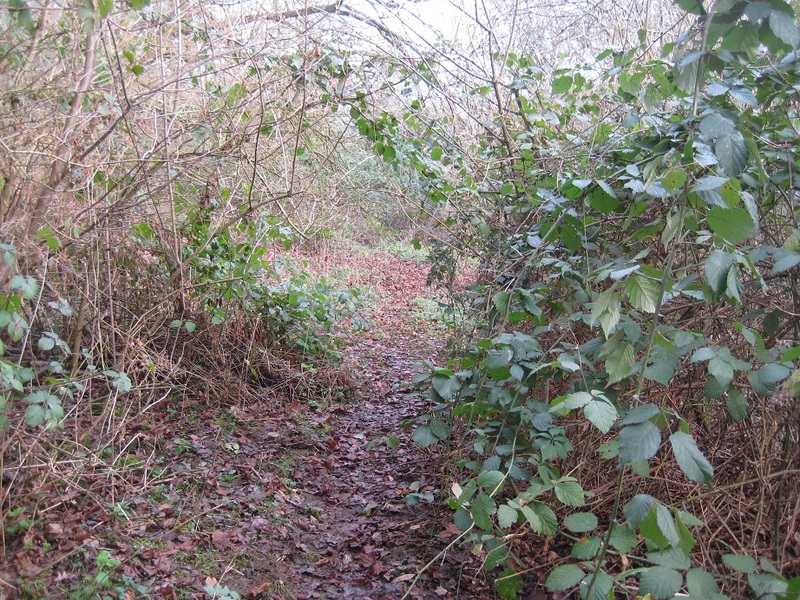 This did not stop the Perkins Family placing three caches on its route, with a view that if cachers walked the path, the brambles, nettles would be cleared and the footpath usable again. This plan had worked as the path was very clear and not impassable at all. Our only problem was locating the start of it, but once we found the middle, we went up and down it quite quickly collecting three caches. We returned then to the Compass series and found SOUTHEAST. 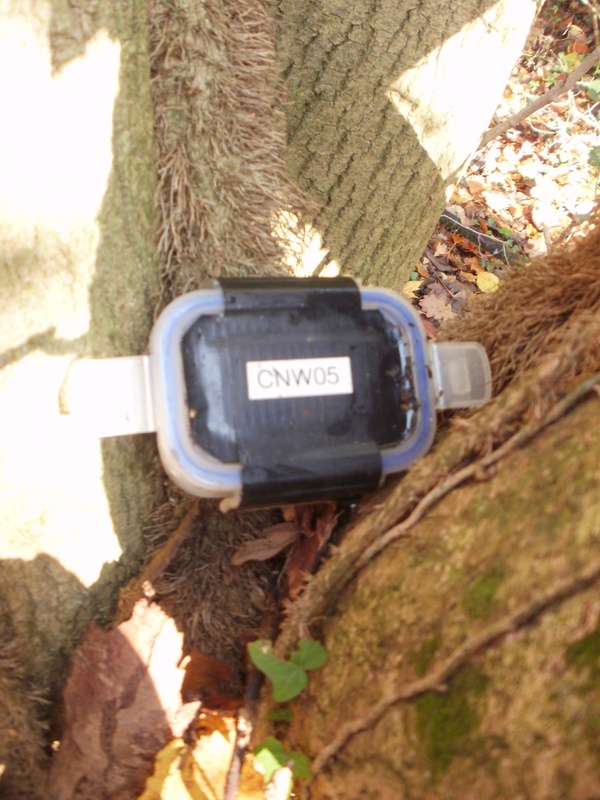 Initially our GPS swung from tree to tree but we found it lodged between stones. Broken and with a gnawed logbook. We reported as needs maintenance, but this cache has had several such comments since August 2018. (Ed : It is always slightly disappointing if cache owners don’t respond to ‘needs maintenance’ requests – even adding a note stating when the maintenance will happen at least proves the maintenance request has been noted). We were at the furthest point from the car park and this meant there were fewer people. In fact we probably went 45 minutes or so without seeing anyone. Our solitude was broken as we headed to EAST (straightforward once the cacher’s path was located), and then onto NORTHEAST. Here we the cache was seemingly placed between two footpaths. We, of course, took the wrong one and had to walk back and find the cache (easily) from the other direction. 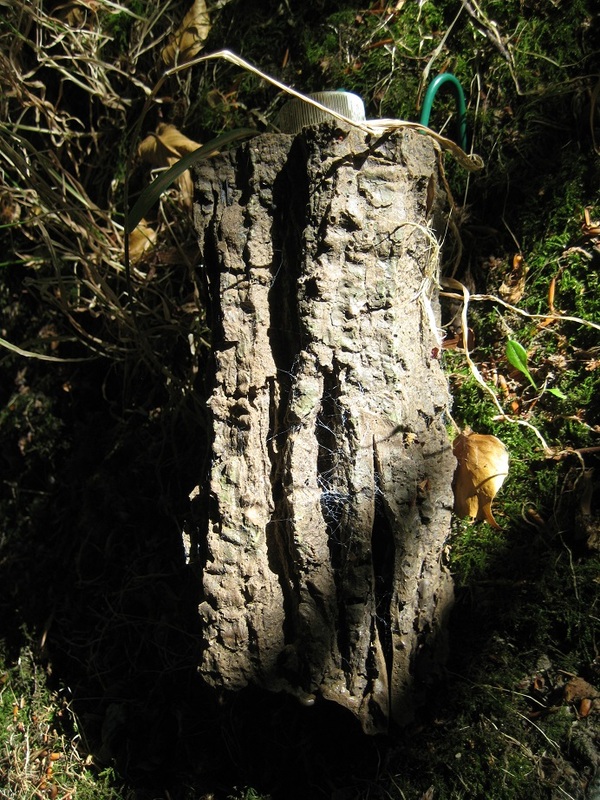 Our last cache in the Compass series involved another longish walk to NORTH found under a very heavy log, which needed one of us to lift as the other grabbed the cache. 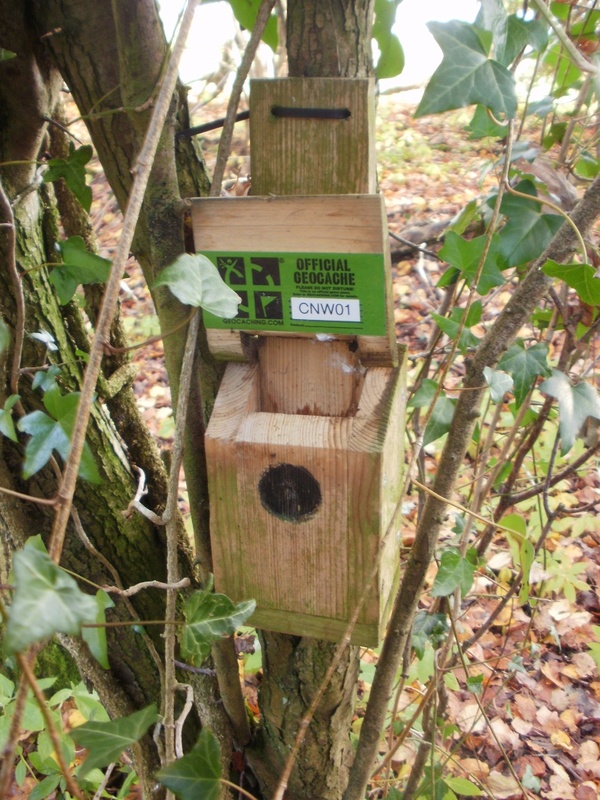 We then had a couple more Perkins Family caches to attempt. The first was just off the North Downs Way. Up a slope. A fearsome slope. The tree cover caused the GPS to wobble. We precariously went up and down the slope, searching trees and logs until the GPS finally settled. The distance dropped from 24 feet (a major achievement after 10 minutes searching) to 20 feet, to 16 feet..to 12 to 10. We were there! Phew! One cache left, and our longest and hardest walk yet. 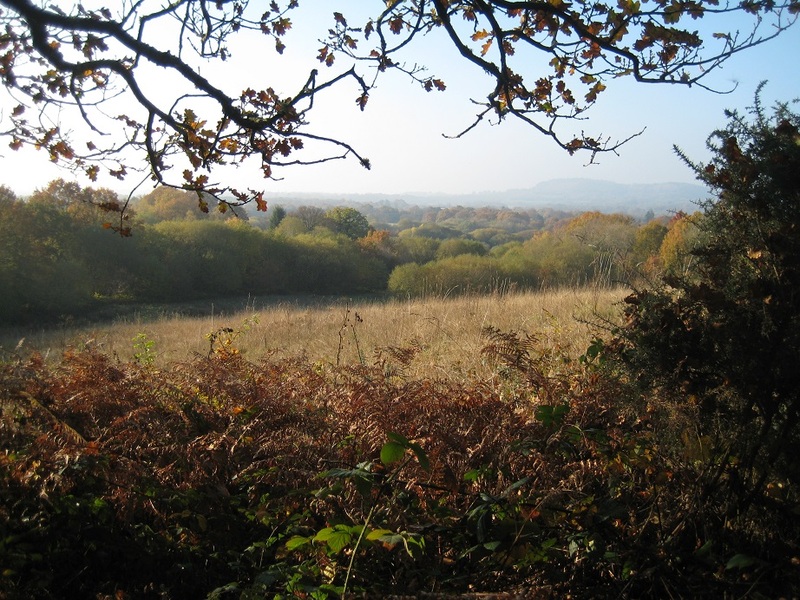 The Chantries is riddled with dry river valleys. Several of these valleys are the subject of one of the Earthcaches we decided against so we were slightly annoyed at having to climb up a valley slope, down to the valley bottom and re-climb again to reach our final cache. Exhausted we made our way back to the car. We’d found 12 out of 14 caches, walked nearly 4 miles and climbed 750 feet. Not bad for a post-Christmas workout. 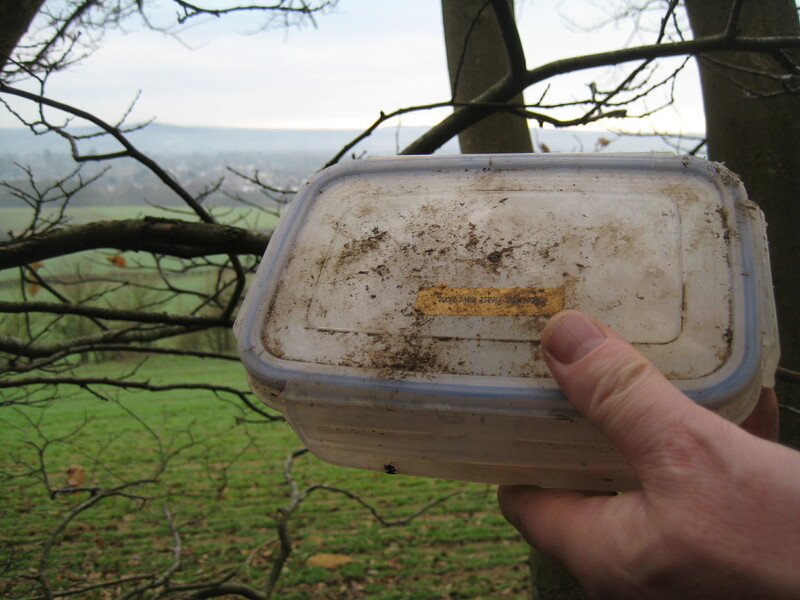 Many of the caches were 1 or 2 litre food containers… two notable exceptions will appear in our ‘caches of the year’ which will be published in a day or so. 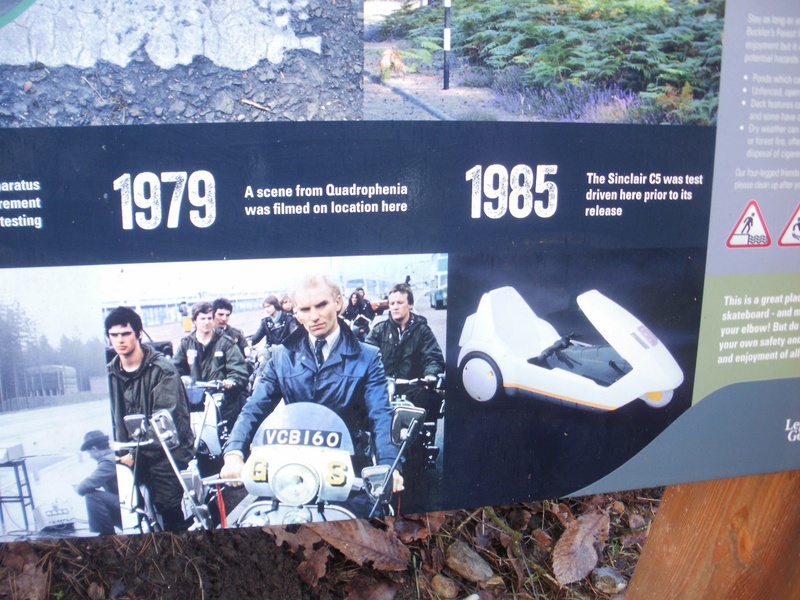 There’s parking here, overlooking the new houses on one side and the park on the other, and we started the morning by finding a puzzle cache based on the history of the TRL, which we had looked up before setting out https://en.wikipedia.org/wiki/Transport_Research_Laboratory After reading some well put-together noticeboards telling us about the history of the site (among many other things, part of the film ‘Quadrophenia’ was filmed here), we set off along a well surfaced and unmuddy path into woods. 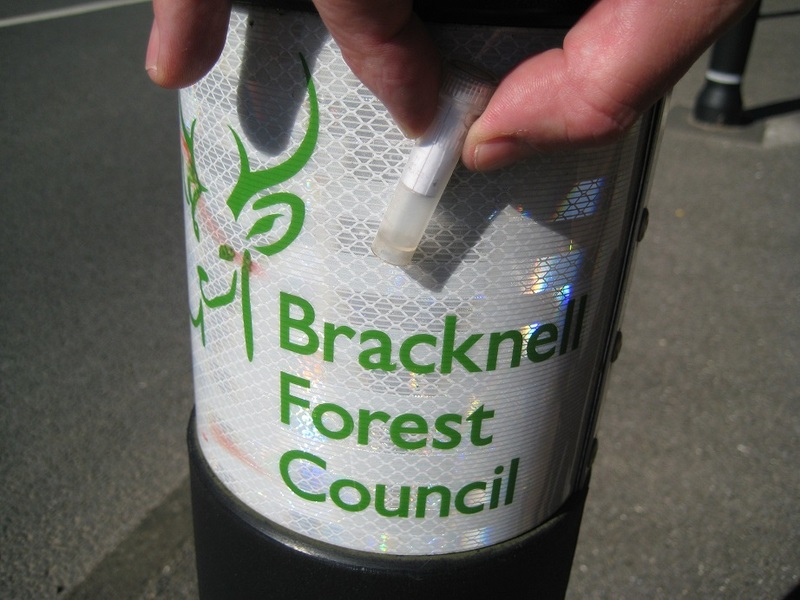 There are two new cache series here, ‘New Buckler’s Forest TRL Series’ parts 1 and 2, both placed during the autumn of 2018. The caches are set at regular intervals, close to well surfaced paths, and all are made of/hidden in materials derived from the site or chosen to blend in with the places they are hidden; there are no ill-disguised film canisters or out-in-the-open plastic boxes to be found here; I’m trying not to spoil it by giving away exactly what we found, or where. 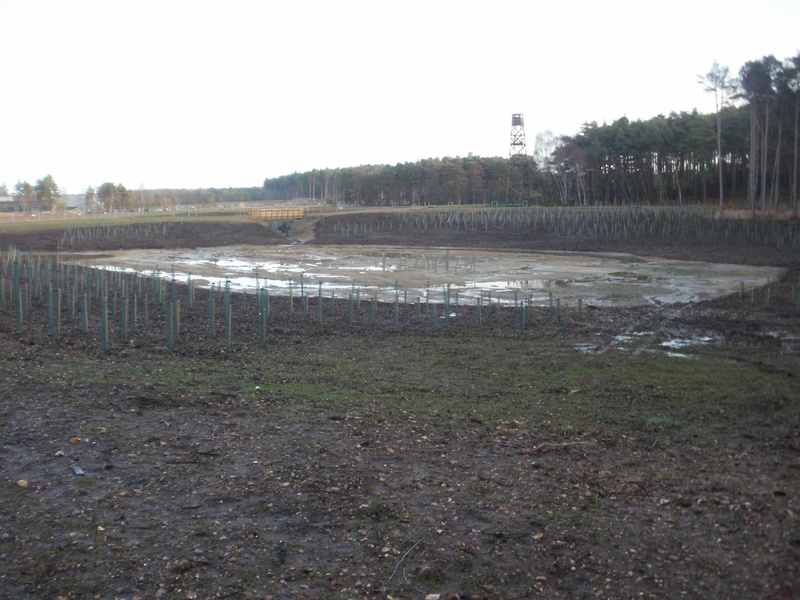 The country park has retained some parts of the old test site, and there are loads and loads of newly planted trees, lots of varieties, several ponds, and streams newly unearthed from being culverted under the concrete. On this morning, at probably at many other times, this park is hugely popular with walkers, runners, cyclists of all speeds, and dogs in all sizes, shapes and muddiness; it’s hard to find a quiet moment to search for a geocache! 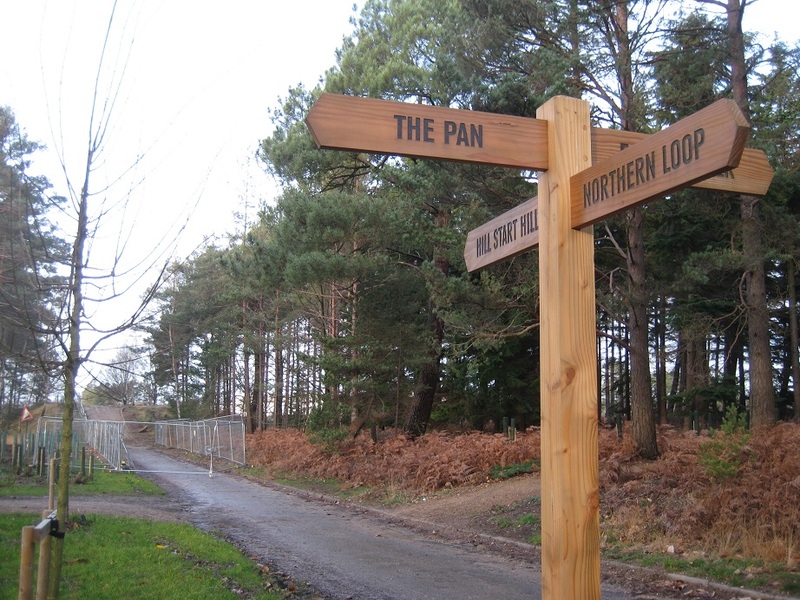 We walked past the site of ‘The Pan’, which makes for both interesting signposts and some old and obvious jokes, past ‘Hill Start Hill’, and on to a section of old tarmac which must have been an experimental cycle lane junction, complete with road signs (they were tested on this site), and on towards the northern edge of the park. Out of position road sign? 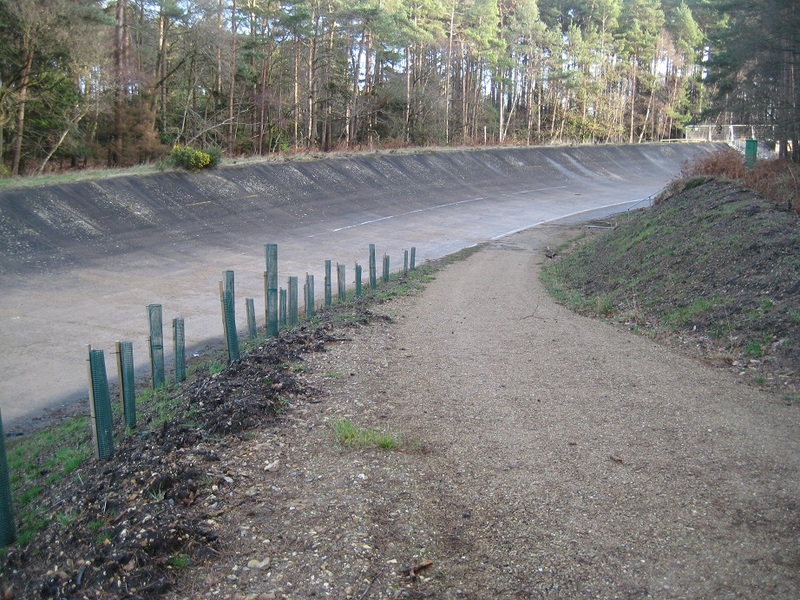 The trees thinned, and we emerged onto a wide section of tarmac which turned away from us, the ‘Banked Curve’. This is part of the test circuit from the TRL, where cars used to hurtle around at very high speeds. It’s 10m from bottom to top of the banking, and we both tried, and failed to climb it, though, annoyingly, dogs have no problems. 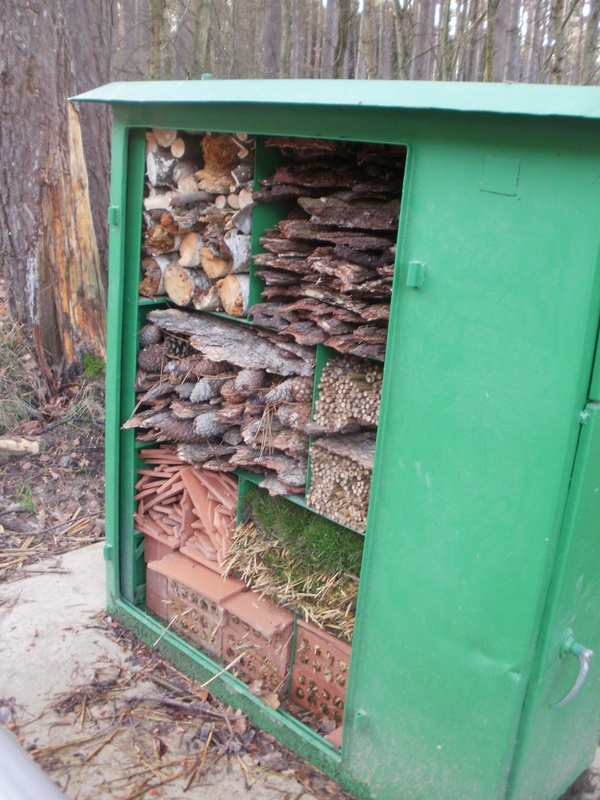 Around the edges of the banking are small green boxes (a bit like telecoms boxes), monitoring boxes left over from testing days, and these have all been kept, some re-used as minibeast hotels, some to become mini-museums or libraries. 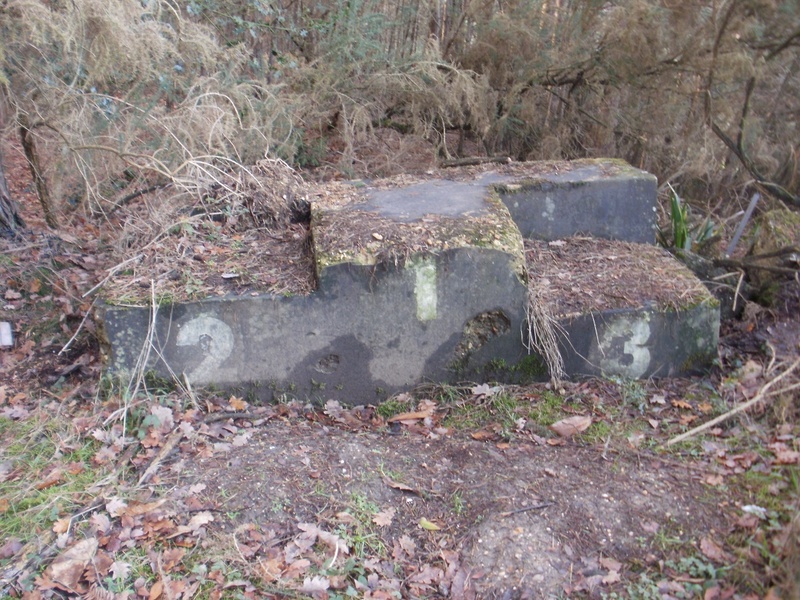 Turning back towards the car park, we passed the old fire ponds and fire tower, plus a relic of something automotive … a winner’s podium … strange. No races near here recently! After a few more minutes we were back at the car park, and two hours had vanished in a flash. 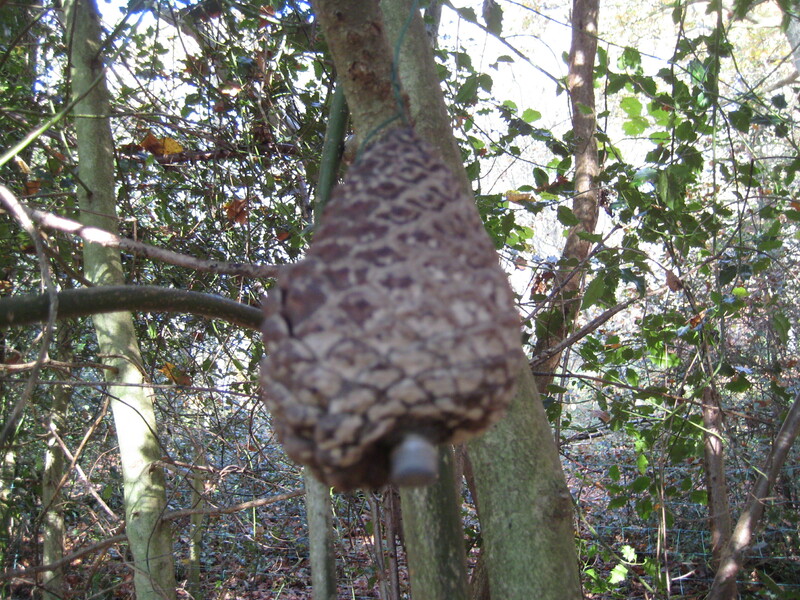 Ten caches attempted, ten found, and an interesting country park. It’s good now, though very, very new. Come the spring, with new growth, it’ll be lovely, and even better with a few year’s maturity, a good place to return to as it develops. Where to go caching? All summer, our caching routes had been determined by our walking quest for the year, from Sandhurst (Gloucestershire) home to Sandhurst (Berkshire). We completed that in early November, and now we had to choose a route for ourselves. 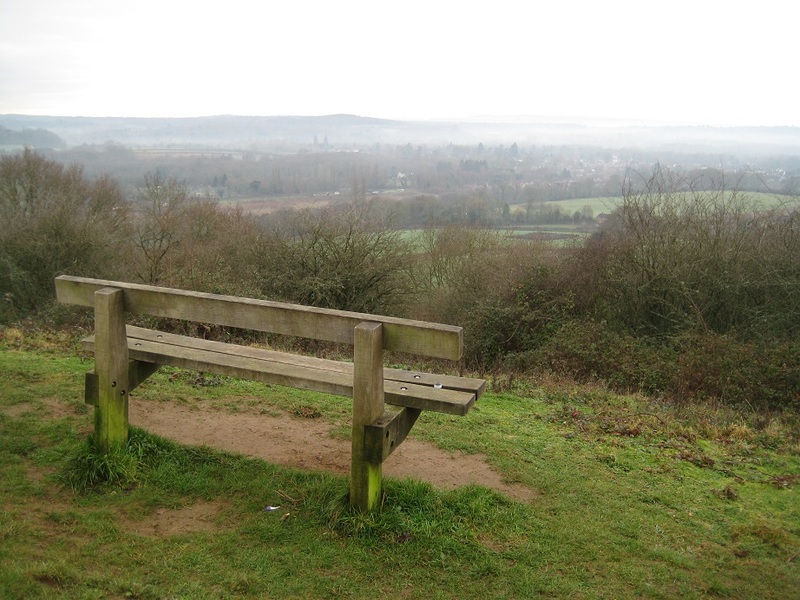 After a little thought, we settled on Cranleigh, at the foot of the Surrey Hills. We walked there last year on our route from Sandhurst (Berkshire) to Sandhurst (Kent), and had planned to return one day; today was that day. 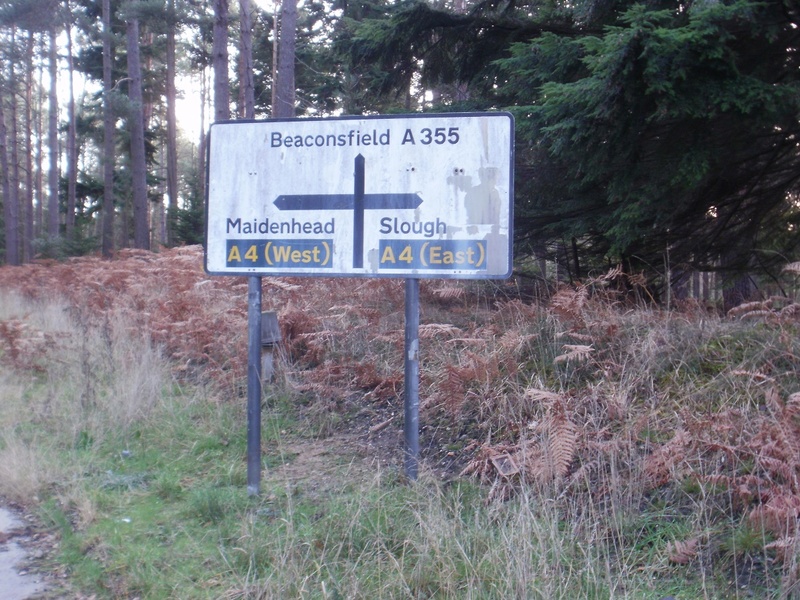 We were to tackle the ‘Cranleigh North Walk’ (CNW) series, a four-mile route covering sixteen caches, starting at Smithwood Common. Two other caches, not part of the series, were close to our start point, so we added those, and did them at the beginning. It was cool, almost cold, and slightly misty as we soon found the first of those two caches, one from the ‘Fine Pair’ series (themed around a phone box and post box within sight of each other – an increasingly rare thing), and the other called ‘Four Elms’ and named after a now-departed pub. As we walked towards the start of the main walk, something gave us pause: two Remembrance Day crosses in a front garden. Just over a hundred years ago, two residents, a father and son, judging from the ages, had set off for war from that house. Neither returned, and they are buried in different parts of Europe. Very sad. We looked for the path that would lead to the first of the CNW series, fording a small stream and setting off along a hollow ‘path’. 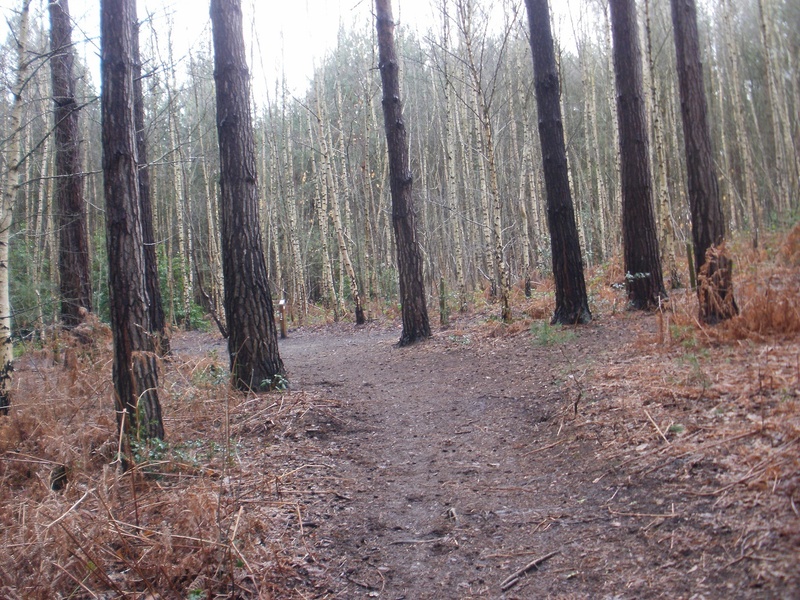 We soon realised we had made a mistake – no way was this a path! 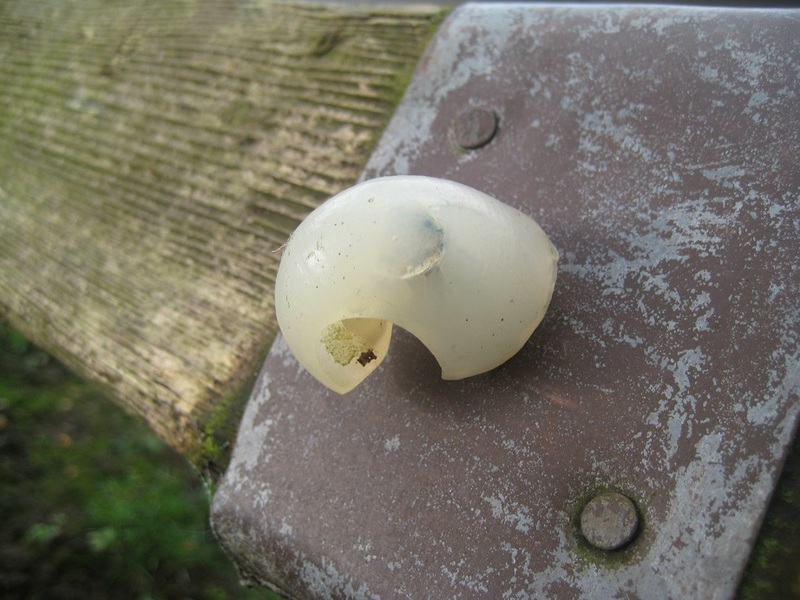 – and we hadn’t brought a machete, but we bushwhacked determinedly on, and arrived at the first cache in the series after about twenty minutes, scratched and dishevelled. In hindsight, which is easy, we did the same kind of thing when we first stated caching – we chose the shortest (but not necessarily easiest) route to a cache. It seems we have not fully learnt that lesson! … maybe there was an easier path? 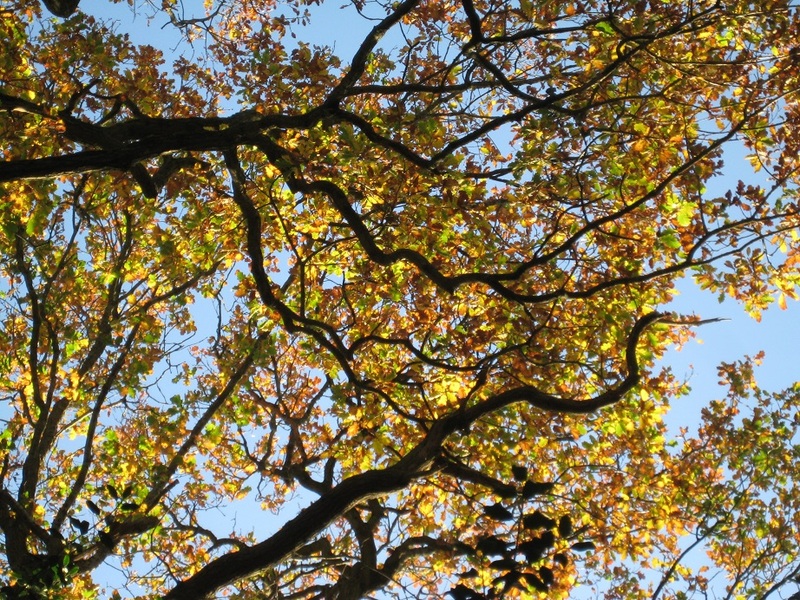 We walked on along a track high in the late autumn woods, with golden leaves thinning to bare branches. Once, a tiny broken branch showed us the way to the cache; a few, we couldn’t find; another, we nearly missed till we almost walked into it … there was an excellent variety of things to find (or not find). 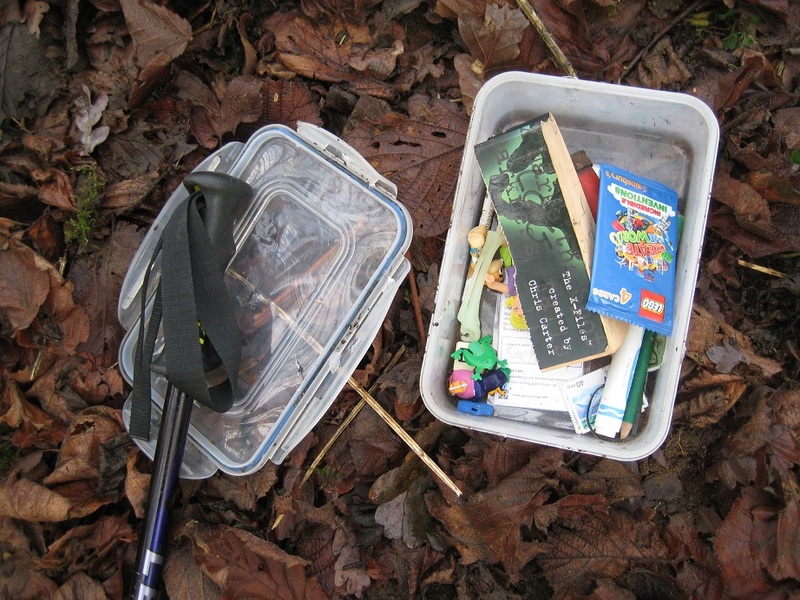 Further on, along a woodland path, we arrived at a letterbox cache. It was a distance, and a direction, away from the published coordinates. We each took a bearing, and paced off in what we hoped was the right direction, ending within two arm’s length of each other – and the cache was between us. Teamwork! 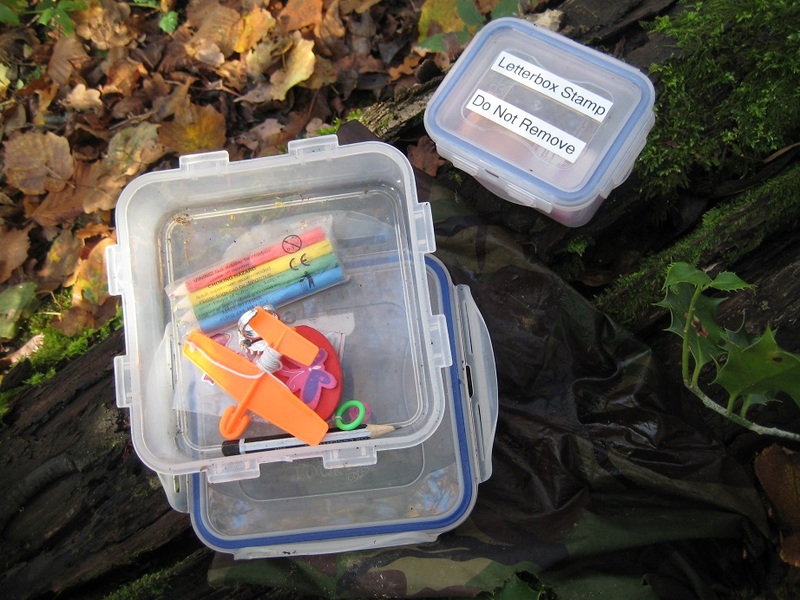 The caches kept coming, and a varied selection they were, too. Some of the containers included fake pine cones, mushrooms, and a (very realistic) plastic hedgehog. We were nearly back at the car now, finding the last two caches in the series as we walked through the fields, then along the road for a short distance as the sun dipped and the afternoon cooled. 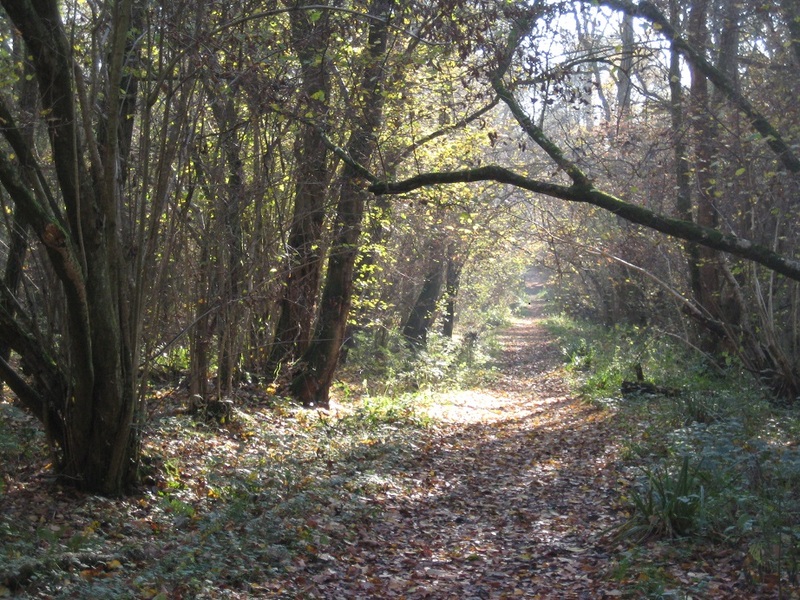 To sum up: this is a beautiful walk, through woodland, open fields and commons and almost all on paths and tracks, a great way to spend a sunny late autumn day. 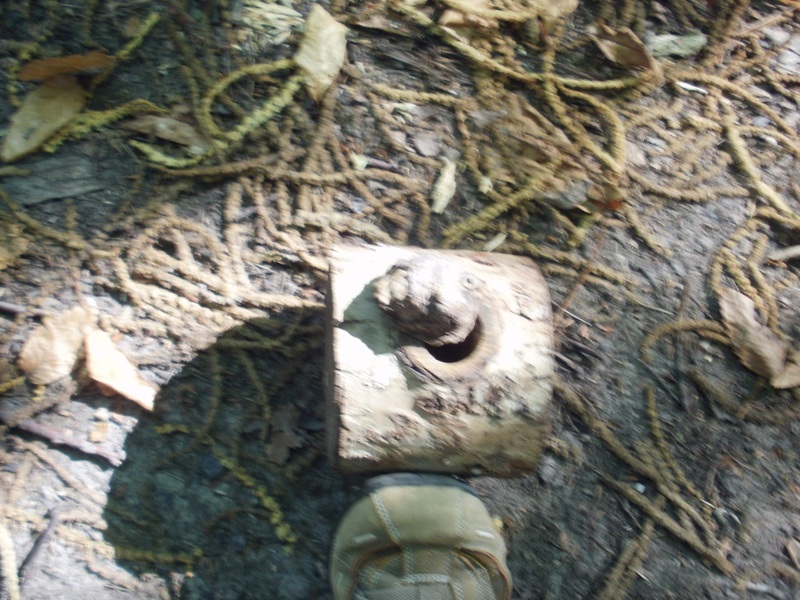 On a beautiful, hot Saturday afternoon, perfect for caching, what were our plans? To visit some private gardens, which were open for charity, to raise money for St Peter’s Church, Cranbourne. One of those gardens belongs to someone we know, so we went along to provide support, and also to visit some of the other gardens. 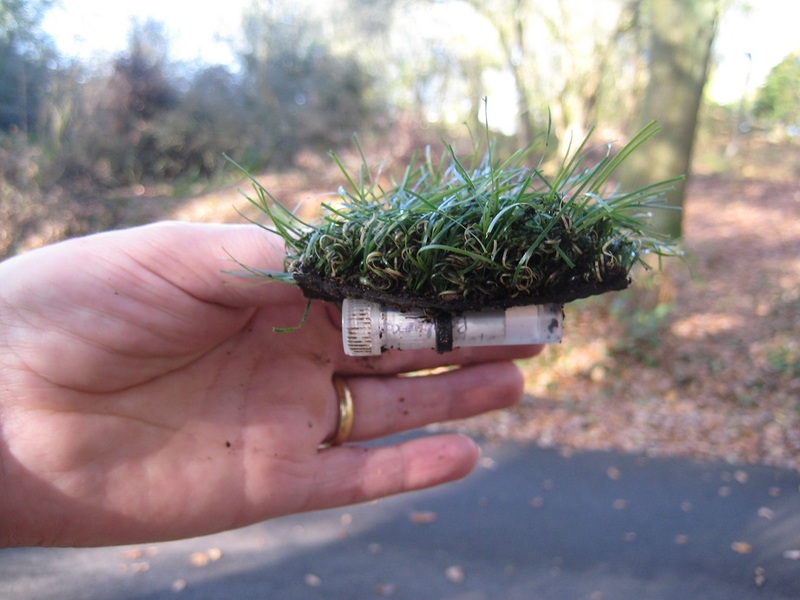 Well, every one was pristine – we spotted one owner removing a miniscule feather from his immaculate lawn. 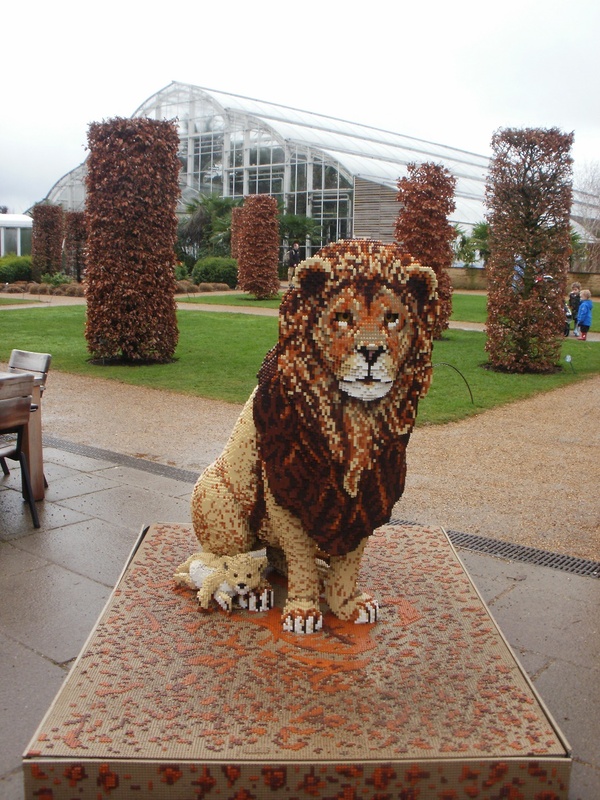 And there was a lot to see, including llamas, waterfalls, astroturf and endless statues. What with all of that, it was well after 4pm when we finished our fifth garden visit. 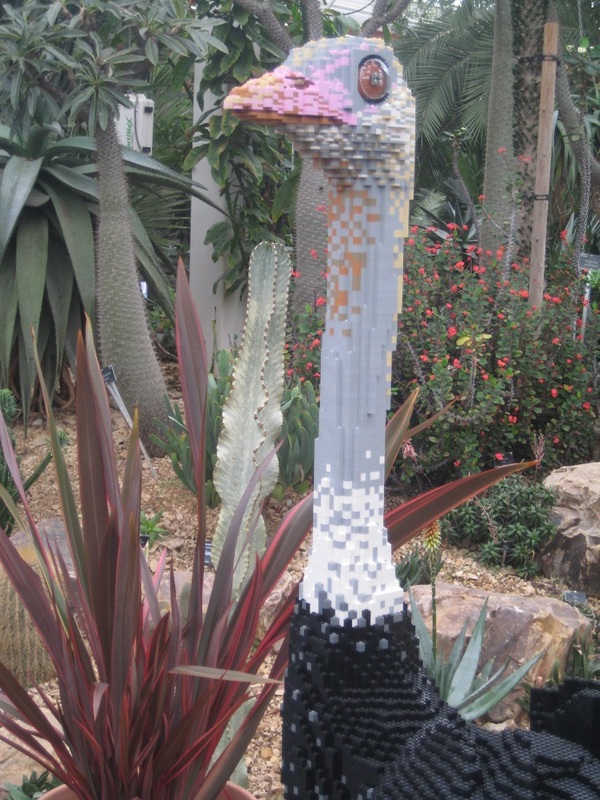 As thay are all private gardens, we haven’t got photos – sorry. With the heat of the day just beginning to wane, we had sorted out a handful of caches to do in the area. 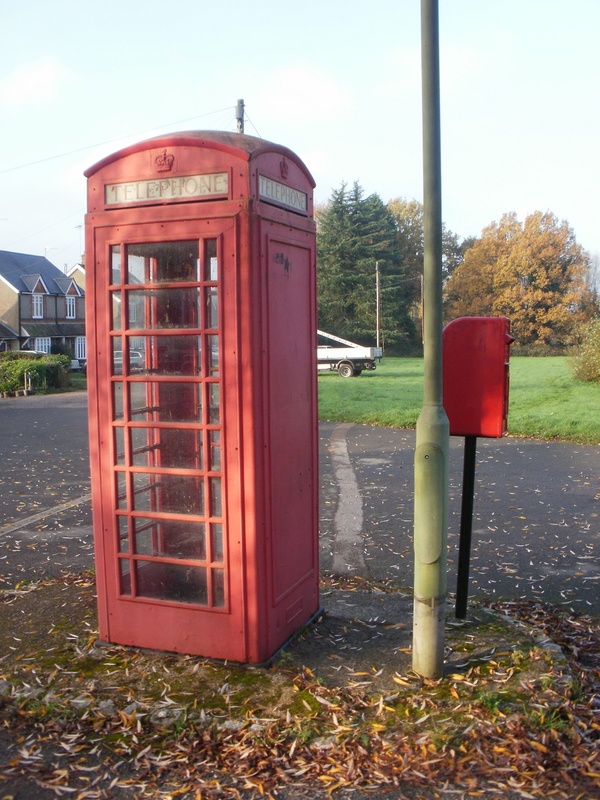 The first was the intriguingly named ‘TGP1 – Gold Cup / Cranbourne Tower’. 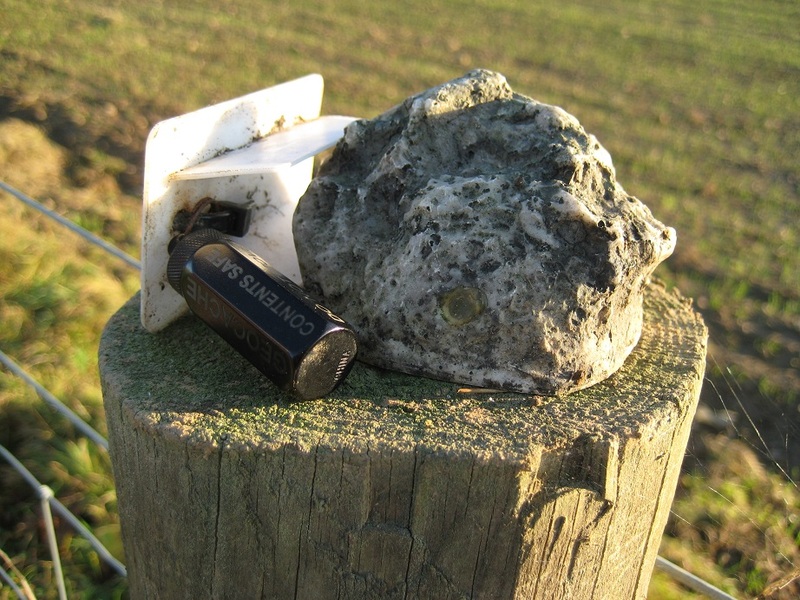 The cache was placed to commemorate two nearby pubs which are now no more – and TGP=”time, gentlemen, please”. 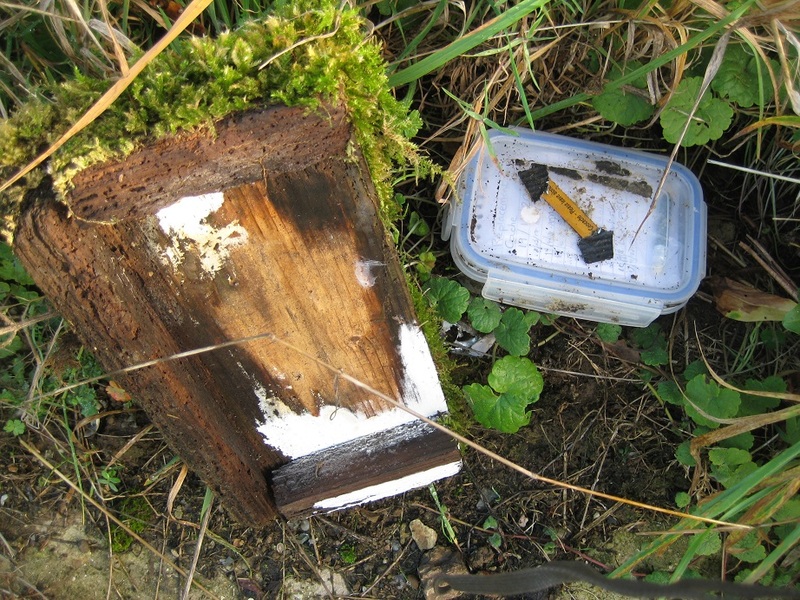 The cache was a small micro on a busy roadside, hidden close to the building site that has replaced the Gold Cup pub. 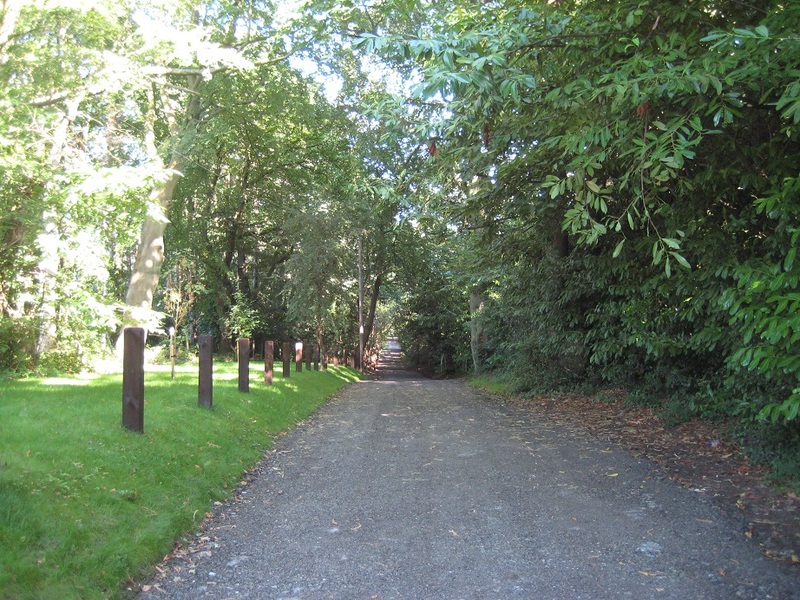 We had a pleasant walk along the track, and back, in welcome shade, and an equally pleasant time searching for, finding, and opening the four bespoke caches. To say much more would spoil the fun. And what of St Peter’s Church, which was the focus for our afternoon out? It has a Church Micro, but it’s a relatively complicated multicache, and we hadn’t got it on our list as we knew we wouldn’t have time to solve it. One for another day! 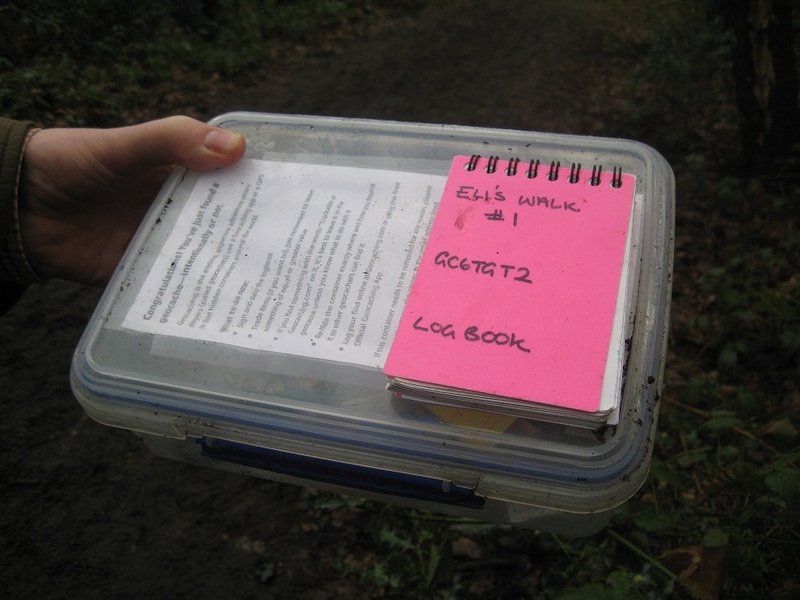 It’s been a while since we found a trackable, and here was one to be rescued from an uncertain fate … we were out geocaching in the woods of the Ashridge estate, following groups of geocachers from cache to cache. Something glinted underfoot, and we looked down. It was this geocoin, dropped and alone on the path. It was already partly hidden by leaf litter, and would have soon been hidden from view. 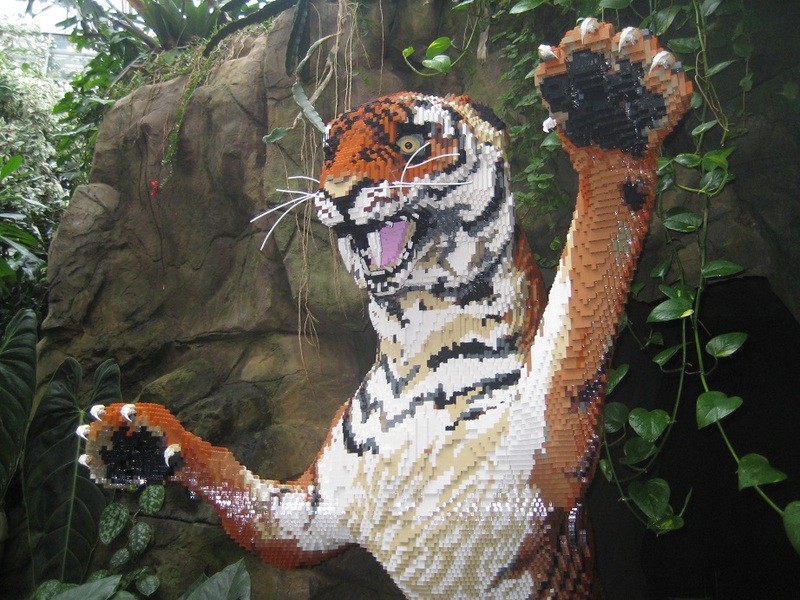 But it was spotted, and saved! Once retrieved, we waited a little while to see if whoever had it before woujld log it – no-one did – then marked it as in our possession. 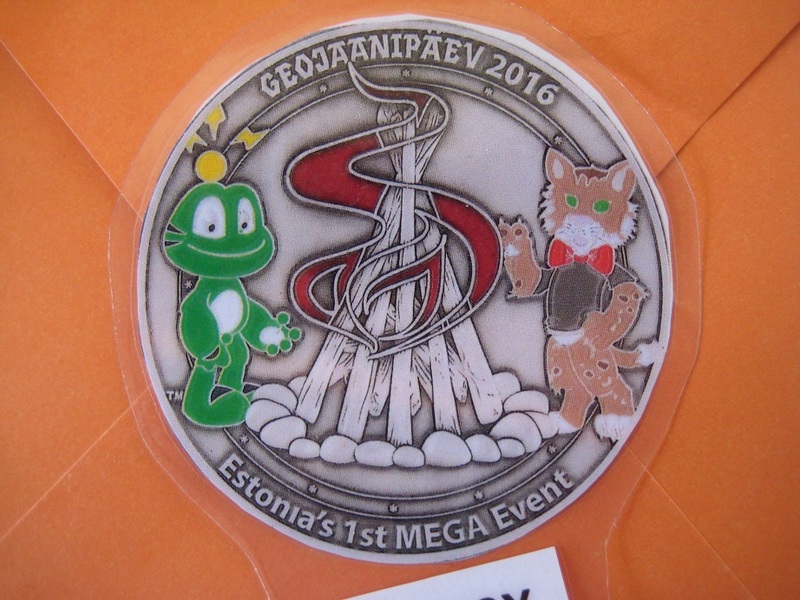 We did a little research on its history, too … it’s very, very new, being purchased at the Mega event in Estonia, being placed in a cache in Finland on 20th July 2016, picked up later the same day, and being taken straight from there to the Geolympix, another mega-event, on July 31st. 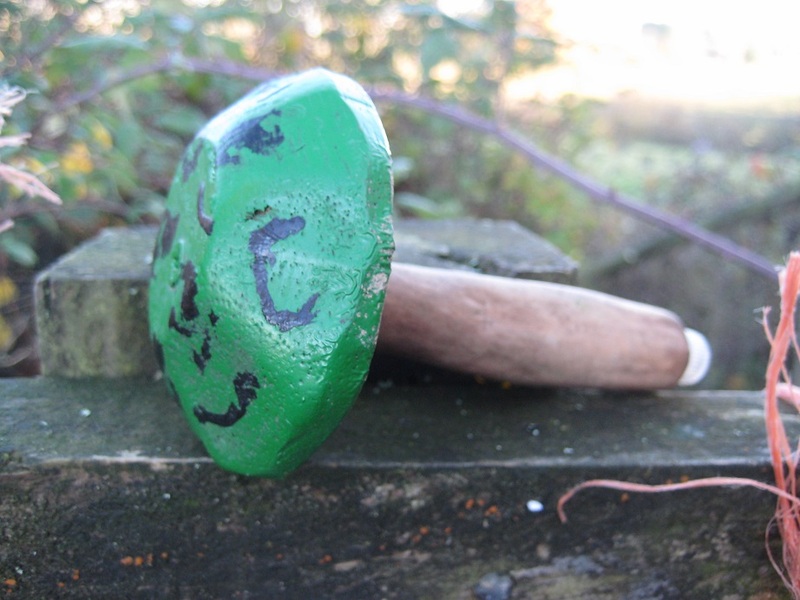 A short life so far, but eventful and filled with big geocachers events.